Sgt. 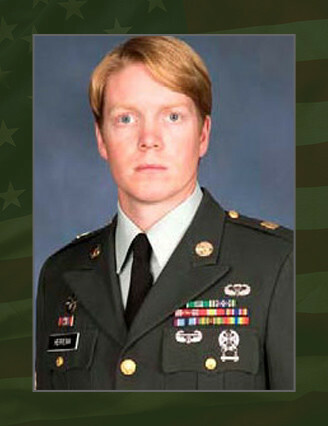 1st Class Richard J. Herrema was killed in combat during operations April 25, 2006, in Iraq against known enemies of the United States of America. He was born March 28, 1979, in Grand Rapids, Mich., and graduated from Unity Christian High School in Hudsonville, Mich. He first entered the U. S. Army as an infantryman on Jan. 11, 1999. After completion of initial Basic Entry Training, he was assigned to B Company, 3rd Battalion, 327th Infantry Brigade, 101st Airborne Division (Air Assault), Fort Campbell, Ky., and then as a Squad Leader in Headquarters and Headquarters Company, 3rd Battalion, 327th Infantry Brigade, 101st Airborne Division (Air Assault), Fort Campbell. He graduated from the Special Forces Qualification Course in June 2003 as an 18D SF Medical Sergeant and was assigned as an instructor in G Company, 1st Battalion, 1st Special Warfare Training Group (Airborne) at Fort Bragg, N.C. His last assignment was as a team member assigned to the U. S. Army Special Operations Command, Fort Bragg, N.C. In addition to the Special Forces Qualification Course, he completed numerous military courses including the Air Assault Course; the Combat Lifesaver Course; the Ranger Course; the Basic Airborne Course; the Special Operations Medical Sergeant Course; the Basic Noncommissioned Officer Course; the Survival, Evasion, Resistance, and Escape Course; and the Military Freefall Course. His awards and decorations include two Army Commendation Medals, five Army Achievement Medals, two Army Good Conduct Medals, the National Defense Service Medal, the Iraq Campaign Medal, the Global War On Terrorism Service Medal, the Humanitarian Service Medal, the Noncommissioned Officer Professional Development Ribbon with numeral two, and the Army Service Ribbon. During his career he had also earned, the Military Freefall Parachutist Badge, the Parachutist Badge, the Air Assault Badge and both the Special Forces and Ranger Tabs. Herrema was posthumously promoted to Sgt. 1st Class. He was also posthumously awarded a Bronze Star Medal for valor, the Defense Meritorious Service Medal, the Purple Heart, and the Combat Infantryman Badge. He is survived by his parents, Richard and Mary Herrema, and his sisters, Katie Lynn and Janie Lynn Herrema.